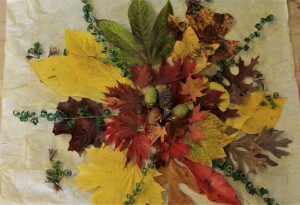 A mandala with an assortment of fallen leaves from Blithewold’s arboretum. Mandalas are ancient symbols representing various meanings of unity and harmony. Walking along a path sprinkled with fallen leaves releases my inner child-like nature. It may be the familiar crunch under foot or the shuffling tendency of my feet to brush the excess leaves away. It could also signal in my head years of raking piles of leaves then jumping in or the brisk cool temperatures mixed with the smell of a smoky leaf burn. Or it could just be the delight in seeing gloriously colored leaves mixed together and scattered about. 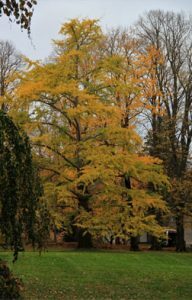 As I walk along I can’t help but admire the spectacular fall foliage that Bilthewold’s arboretum has in its tree collection. The late season fall color is dramatic. The trees’ colored foliage is not just pretty but it’s also practical. Shorter days and cooler temperatures trigger hormones in the tree to build up a layer of cells at the base of each leaf stem to shut off its supply of food. Photosynthesis and chlorophyll production stop and so does the green color. The true colors of the leaves shine through in one last fall finale before the leaves are shed. This is a practical survival method for a tree as it could not support leaves through the winter’s freezing temperatures. 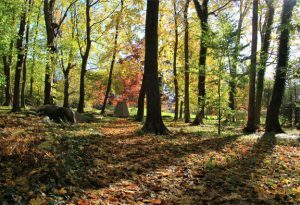 Seeing the beauty of nature, admiring the fall foliage of trees and walking among their fallen leaves is a great way to experience horticultural therapy. Even the honeybees are relishing in the sunshine of the fall season. 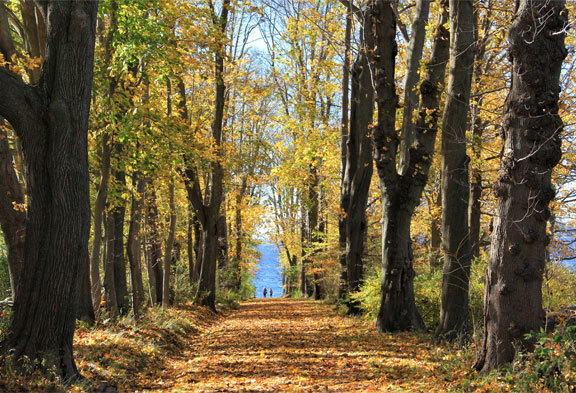 When the weather cooperates with warm sunny days it’s time to get outdoors and enjoy the autumn leaves aplenty. Click here to see Gail’s video of honeybees.